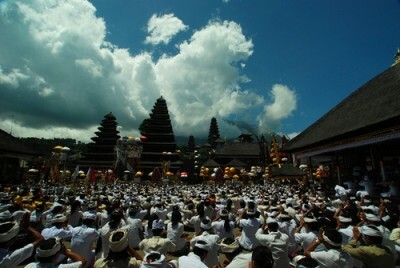 Ekādaśarudra (also Bhūta Yajña) takes place once in every hundred years; it is a ritual ceremony in which all life on Bali will be purified from evil influences. 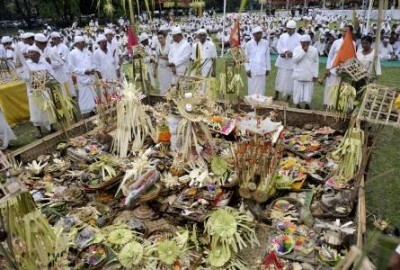 Thus, in the months prior to Nyepi, the bodies of the deceased that are already buried but have not been cremated yet will be dug up and still be cremated. Pañcavalikrama is in many ways similar to Ekādaśarudra, yet the only difference being that the Pañcavalikrama ritual is conducted once in every ten years; the annual celebration of this ritual is called ‘Tawur Kesanga’. Like Ekādaśarudra Pañcavalikrama and Tawur Kesanga are a purifying ritual as well, though these are performed on a much lesser scale than the Ekadaśarudra is. Bakker, Freek L., 2001: ‘Balinees Hindoeïsme: de Godsdienst op het Eiland Bali in Indonesië’. Uitgeverij Kok – Kampen; pp. 41.